Ottima esperienza con questa società. Personale gentile, preparato e professionale sin dalle fasi di preparazione al volo. Friendly and competent staff. Made us feel very relaxed. Great views ! Highly recommend this flight and will do it again! Bonne organisation, peu d attente, helicopter très confortable, vue sur nyc exceptionnel. Forcément un peu cher.... mais que de souvenirs: on en prend plein les yeux ! This is a special experience, I suggest it to anybody being only for short on NYC as the views are breathtaking! The entire personal was so kind and made us feel very comfortable! The helicopters were looking very well maintained and our pilot was pointing out the highlights during the flight. The duration was indeed 20 minutes as described and there were no extra costs to pay. Absolutely amazing flight, so much fun and fantastic views! But time passes too quickly, so be careful: If you spend all your air time taking pictures you miss the experience! Pilot commented and guided underway. Costumer reception was handled very well by professional staff and crew. 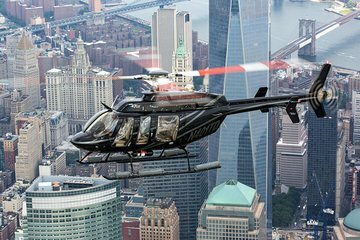 Viator has several helicopter tours in New York. I chose this one instead of the cheaper ones because it spends more time over Manhattan. The price includes a required heliport fee, which the cheaper tours don't include in their prices and you still have to pay it. That means the amount you pay in the end isn't as different as it seems it's not a 100 difference, it's more like 40-60. Most of the tours around this price also fly over Brooklyn, Bronx, and/or Queens. If you're willing to pay that amount but you want to focus on Manhattan, I recommend this one. Fabulous helicopter tour. Very well organised, was very impressed with staff and pilot. Views were fantastic and commentary from pilot was great. Would definitely recommend this tour to see the fantastic New York sky line. Fantastic. Ok I have to say totally scared on this helicopter. The company was great and I was safe but it was scary. But I survived and they were excellent with service and calming me down . sensational, organized, on time. delivered what was promised!